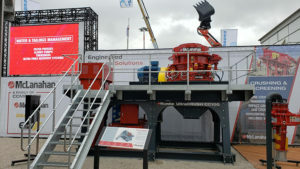 McLanahan Corp. introduced a pair of modular, containerized systems at Bauma in the UltraWash wash plant and the UltraCrush cone crusher. 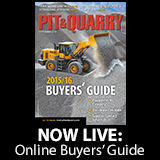 According to McLanahan, the UltraWash is capable of making three aggregate and two sand products while accepting capacities up to 400 tph. It has both a single-process water feed point and a single-effluent discharge point. The modular design offers a compact footprint, the company says. The UltraWash system includes several features to simplify maintenance and maximize production. The underpan of the sizing screen features a fines forward slide. This steel tray spans the width of the bottom deck of the sizing screen and facilitates the diversion of a proportion of raw fines into the coarse sand processing stream to help balance downstream equipment and optimize plant capacity. It also permits the alteration of the proportions of fine and coarse deck areas above while precluding entry of coarse material into the fines processing stream, McLanahan says. Additionally, an EZE-Riser lifting pedal and locking mechanism allows for simplified feed pipe disconnection and the needed clearance for pump removal when maintenance is required. The pumps can then roll out easily onto the pump trolley system, which offers additional clearance for easier access during maintenance. The UltraWash feed hopper and conveyor can be upgraded to come with tracks for easier conveyor maintenance. 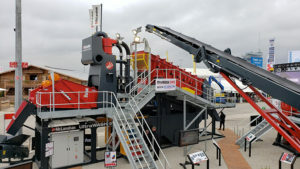 The UltraCrush modular cone crusher is also containerized, easy to set up and install, and can be transported around a site or to other locations as needed, according to McLanahan. The modular cone crusher is made with a heavy-duty cast steel base frame and includes replaceable base frame wear liners. It features a rotating bowl for even liner wear, bronze inner and outer eccentric bushings for more load-carrying capability, and a large, unobstructed feed opening. A hydro-pneumatic tramp iron relief system reduces wear on the crusher if uncrushable material enters the crushing chamber. All McLanahan modular systems are pre-wired and pre-plumbed for rapid on-site deployment or relocation. They are available in a variety of configurations, including double washing and prewashing, and come with fully-integrated controls with remote operation.